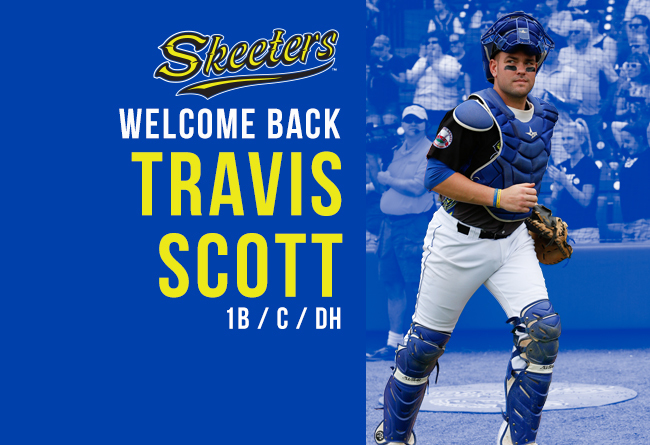 (Sugar Land, Texas, Feb. 9, 2017) – The Sugar Land Skeeters announced today that the club has re-signed catcher and first baseman Travis Scott to the 2017 roster as a player/coach. Scott, 31, returns for his fifth full season with the Skeeters. Last season, Scott batted .264 with 107 hits in 113 games and his 16 home runs (a career high) and 67 RBI ranked second on the team. Scott is a three-time Atlantic League All-Star with the Skeeters (2013, 2015, 2016) including being named the MVP of the 2015 All-Star Game. Opening Day for the Skeeters’ 2017 season is set for Thursday, April 20 at Constellation Field when they host the Bridgeport Bluefish in a 7:05 PM game. Season tickets, mini plans and flex books are on sale now at the TDECU Ticket Office or online at www.sugarlandskeeters.com. Visit the Skeeters website at SugarLandSkeeters.com and follow on Facebook, Instagram and Twitter for all the latest news on the team.